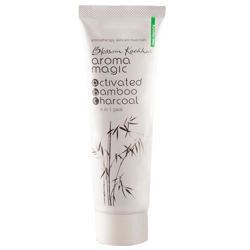 Aroma Magic Activated Bamboo Charcoal 6-in-1 Pack - Lighten & Brighten Skin, Exfoliating Dead Skin Cells, Draws Out Dirt, Oil & Make-up. Lighten and brighten skin instantly by exfoliating dead skin cells. Transform your skin in six miraculous ways. Lighten and brighten the skin instantly by exfoliating dead skin cells. Deep clean with activated carbon that draws out dirt, oil and make-up. Nourish with restorative minerals and vitamins present in Himalayan Clay. Protect with an anti-bacterial shield provided by organic essential oils. Gently smoothen and I also tighten the pores leaving you looking younger, fresher and radiant as ever. Wash your face. Pat dry. Apply a thin layer of the pack to your face and let it dry for 15 minutes. Rinse off. You may follow up with moisturiser.Use once a week for best results.